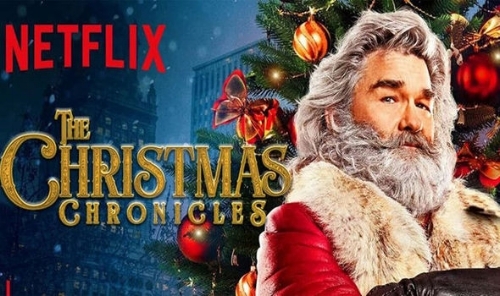 On Thanksgiving this year, Netflix released a new Christmas “classic,” The Christmas Chronicles. I’m always wary of movies that call themselves “new classics.” That usually means they are going to be terrible. Man, was I in for a surprise! The movie has all of the trappings of a typical cheesy Christmas movie - kids, Christmas spirit, reindeer, elves, Santa…blah, blah, blah. This time around Santa is played by Kurt Russell, which is a scary thought, and the kids are older brother Teddy (Judah Lewis) and younger sister Kate (Darby Camp). As usual, Teddy is a troubled teen who is often saddled with babysitting Kate. Blah, blah, blah…they catch up with Santa on Christmas Eve and accidentally crash his sleigh. The rest of the movie is the adventure of getting all his stuff back so he can finish delivering presents. While the beginning of the movie was pretty slow (seriously, who uses cameras that use cassettes any more? ), it really starts to pick up after the big sleigh crash. The best moments mostly involve Santa and his magic, though there are some awesome Kate scenes too. Especially when she has to capture Santa’s reindeer on her own and freaks out when she sees Comet. (“You’re kind of a big deal where I’m from.”) At one point, Santa gets tossed into jail and, to raise the Christmas spirit level, he creates an entire musical production with the other jailbirds. If it wasn’t for the adorable elves (more on them in a sec), it would be my favorite scene. So. Elves. We’re all used to kids or little people playing them. For this movie, they are CGI creatures that speak a completely different language. (It sounds a little Nordic…) Despite the cute factor, you shouldn’t underestimate them. They take down some bad guys, break Santa out of jail, fix the sleigh, and help deliver gifts. These may be the most capable elves ever seen in a Christmas movie. And I kinda want one. In the end, I would definitely recommend giving Chronicles a try. Kurt Russell is perfect as Santa, since he’s not supposed to be the fat jolly man we know as “Santa.” The kids are decent actors as well. (You might know Darby from HBO’s Big Little Lies and Judah from Netflix’s 2017 comedy-horror movie, The Babysitter.) But, hands down, the best part is the visuals for how Santa gets down chimneys (or lack of) to deliver presents and how the sleigh travels around the world so quickly. Oh, and the elves. Gotta love those little guys. Anyway, I might actually agree that this is a “new classic.” If Netflix continues to have it on their streaming service every Christmas, watching this may be our new tradition.